Officer Smalley became the first Utah police officer to die from injuries suffered in a motorcycle accident. 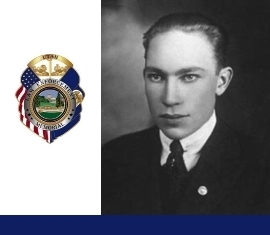 On November 9, 1919, the victim was patrolling for a stolen vehicle near the mouth of Ogden Canyon when he was sideswiped by a passing motorist. Officer Smalley suffered a fracture of his left thigh in the accident. He was transported to a hospital where he died of an infection five months later. Officer Smalley was single. At the time of his death, he was just 20, making him the youngest police officer to be killed in the line of duty in Utah. He is buried in the Ogden City Cemetery. His bronze name plaque is sponsored by the Ogden Police Benevolent Association.